Moving on: with my rava idli steaming in the cooker, and sambaar bubbling away on the hob, I began to crave some sort of chutney to go with this feast!! So I modified a recipe of a tomato pachadi that I love. This chutney can be eaten as is, Alternatively, add a couple of tablespoons of fresh yogurt to get a looser blend that tastes just as yummy!! Heat oil in a pan, add the cumin seeds and roast. Reduce the heat to medium, add the green chilies, cilantro, and the tomatoes. Stir and fry for a couple of minutes, the add the turmeric, chili powder, and salt. Blend well, add 1/4 cup of water. Cover and cook until the tomatoes are soft. Add the jaggery, turn off the heat, and allow to cool for a few minutes. Meanwhile blend the dry roasted peanuts into a fine powder. Pour this powder into the tomato chutney, mix well, and serve warm or cold. Oh hoo.. I would be all confused without my mixer grinder. Idli, dosa, chutney is a must in our house. Sorry, I do not have recommendations as yet, I will check with few of my colleagues. 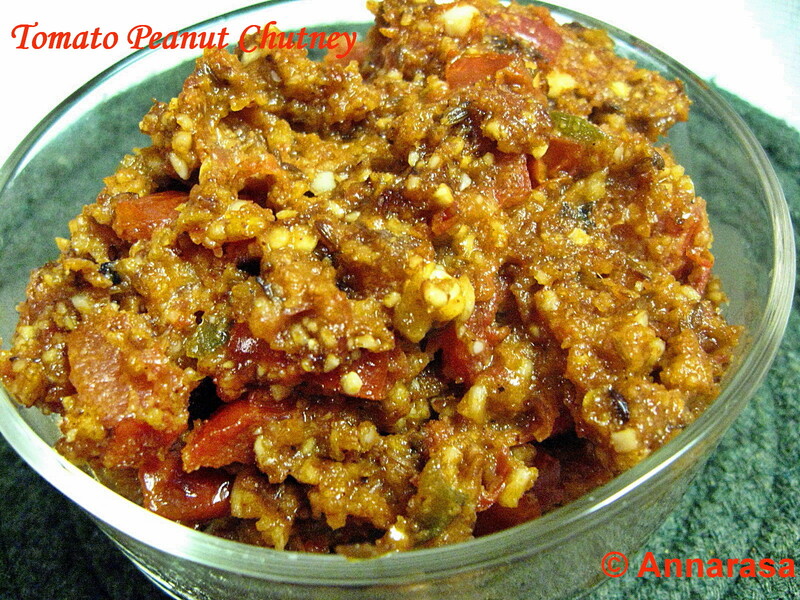 Like the idea of tomato and peanuts. I don't have a desi grinder and I use my cuisinart blender for grinding. I don't make idli dosa regularly but when ever I do make, I use this blender. It comes out fine and I use idli rice for my batters. Yumm thats a droolworthy chutney, definitely new for me..
Bookmarked Apu. I have to try it out soon. Looks so tempting and delicious. I cannot help you with blender advice, but I am intrigued by your chutney!